A former music student of Dr. Rogosinski wrote to ask us why we may have included him on this web site. It's not the first time we've been asked such a question about someone listed that perhaps may not be the truest country music performer, but due to some aspect of their career, did have a part in it. Dr. Curt Rogosinski was such a person. 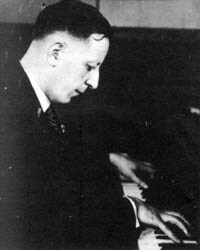 Mr. Rogosinski gave piano lessons to students at his home on 35th Street on the west side of Des Moines, Iowa. His students would also give recitals at Hoyt Sherman Place, which was also the home of the WHO Iowa Barn Dance Frolic. Mr. Rogosinski was also a staff musician for WHO. Mr. George Hamlin writes to let us know that Curt was born in Poland and immigrated to the United States in 1936, perhaps in advance of the changing scene in Europe at the time prior to World War II. Dr. Rogosinski loved his newly adopted homeland. When students had completed their weekly lesson from the John W. Schaum piano lessons, he would paste a U.S. flag sticker on the lesson before assigning the next week's lesson. Mr. Hamlin's mother also took piano lessons with Mr. Rogosinski during this time and with Speck Redd. She learned that Curt had studied with Claude Debussy in Paris for a time. Mr. Debussy was a French composer who achieved quite a bit of fame for his music in the latter part of the 1800's to the early 1900's. A WHO booklet from 1938 indicates that Curt also a pupil of Max Reger, who was a German composer, organist, pianist and teacher. Mr. Hamlin notes he could not imagine him playing country music; but then, he also notes, he could just about play anything. Dr. Curt Rogosinski passed away in October or November 1972 and was a member of the American Federation of Musicians, Local 75, in Des Moines, Iowa. Hillbilly-Music.com wishes to express its appreciation to George Hamlin, a former music student of Dr. Curt Rogosinski for sending us his recollections.